Washington, D.C. is easily accessible with three major airports, the Metrorail and bus system, and ground transportation options. As a major metropolitan area, travel times can vary considerably depending on the time and date of travel. It's also important to keep in mind our 3:00pm check-in and 11:00am check-out time when planning your travel to and from campus. National Airport is the closest and most convenient to the University. From the airport, the Metrorail Blue Line connects directly to the Foggy Bottom-GWU Metro Station. Dulles Airport is more distant in the Virginia suburbs and serves as the regions main international airport. The new Silver Line Express Bus easily connects the Dulles terminal to the Wiehle Reston East Station where you can board a Silver Line train directly to campus, allowing guests to bypass traffic within the DC Beltway. BWI Airport, in Maryland, is the most distant area airport from the campus. BWI is accessible to DC by Amtrak into Union Station, Metrobus B30 connecting to Metrorail at Greenbelt Station, and by Super Shuttle. At Greenbelt Station, board the Green Line in the direction of Branch Ave.
Rail service into Washington, D.C. terminates into Washington Union Station. This is also where you can find BoltBus, Greyhound, and Megabus. Inside Union Station, you can board Metrorail for a short subway ride to the heart of the Foggy Bottom Campus. Commuter Rail, Amtrak, and buses are located upstairs on the main level. The Washington Metropolitan Area Transit Authority provides an extensive network of train lines that serve most of the city and Maryland and Virginia suburbs, as well as Reagan Washington National Airport. Metrorail service is complimented with Metrobus service throughout the DC metro area. The Foggy Bottom-GWU Metro station is located on campus at 21st and I Streets, NW and is served by the Orange, Blue, and Silver Lines. Washington D.C., is located inside the Capital Beltway (I-495), accessible from north and south on Interstate 95, and from the west on I-66. Traveling by car around the Washington area can be challenging, particularly for first-time visitors. Hourly visitor parking is avaibale in the Science and Engineering Hall 24/7. The parking garage itself is located on H St between 22nd and 23rd streets. You can use the following address for Fulbright Hall which is directly next to the garage entrance to guide you to the correct street and block. 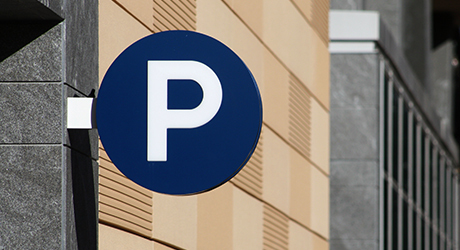 Hourly visitor parking is available on the Foggy Bottom and Mount Vernon Campuses. Weekly parking is also available for Long-Stay guests only. Reagan National Airport is the closest to GW and connected directly by the Blue Line Metro. Travel time on rail and road is about 15 minutes. Dulles Airport is more distant in the Virginia suburbs and serves as the regions main international airport. Travel time by road and rail is about 60 minutes. The Silver Line Express Bus connencts Dulles Airport directly to the Silver Line Metro during construction. The Silver Line serves the Foggy Bottom-GWU Station. BWI Airport, in Maryland, is the most distant area airport from campus. Travel time by road and rail is between 60-90 minutes.